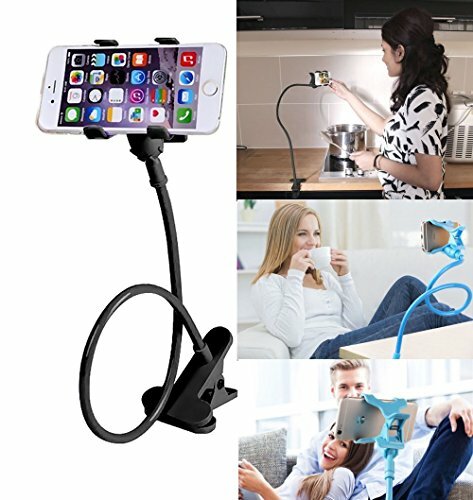 SLBSTORES Cell Phone Holder Universal Gooseneck Cell Phone Clip Holder Lazy Bracket Flexible Long Arms free up your hands and enjoy your phone anywhere Bedroom, Office, Bathroom, Kitchen,Car etc. Compatible for a Wide Range of Devices • Apple: iPhone 6s/6/6plus, 5S/5C/5/4S, IPod Touch. • HTC: DROID DNA/One/8X/8S/Sensation/Amaze/Radar/EVO/Inspire/Incredible/Rezound. • Motorola: Moto X/Droid RAZR/MAXX/HD/Droid 4/Triumph/Photon 4G/Droid X.
free up your hands and enjoy your phone anywhere Bedroom, Office, Bathroom, Kitchen,Car etc. • Apple: iPhone 6s/6/6plus, 5S/5C/5/4S, IPod Touch. • Samsung: Galaxy S3 S2/ Galaxy Note 1 2 3/Mega5.8/Nexus Prime/Epic 4G touch/Focus S/Infuse. • And Many Other Devices of the Width 1.18″ – 4.7″. Mobile Phone Holder, Compatible with iPhone 6, 6 plus, 5, 4s, 3gs, iPod, GPS, PDA, Samsung galaxy s2/s3/s4/s5/s6, HTC, Nokia, LG, blackberry etc. Totally length 29.5” inches, biggest holder size is 4.7” inches Phone Width. CLIP: Attaches to virtually any table or counter up to 2.7″ thick. Can be mounted onto any table, desk or counter top and allows you to use your smartphones in any position you want. Perfect for viewing phone & enjoying music & Playing Mobile games on bed, desk, car, beside sofa, or while doing laundry, exercising, Cleaning, Etc is an essential accessory for your vehicle to be able to navigate for convenient. Quick and easy installation, No tools required. Total POS POS. Can’t even support its own weight. Total collapse when a phone is placed within its plastic clamp. The clamp that is supposed to temporarily affix it to a stationary object slides off easily. Don’t waste your time. Perfect Phone holder for watching videos!! !